Weather in Argilly, near the finish, at 1:40 PM, local time: 32C (89F), sunny, with the wind from the SSW at 19 km/hr (12 mph). No rain is forecast. The race: All 193 of stage 6's finishers started today's stage. The official start was given at 12:23 PM. We had another day with the break blasting away from the field shortly after the stage began. Today it was Manuele Mori (UAE Team Emirates), Yohann Gène (Direct Energie), Dylan van Baarle (Cannondale-Drapac) and Maxime Bouet (Fortuneo-Oscaro) who took off. The quartet has not been taking it easy. They covered 43.9 kilometers during the first hour of racing. Km 62: The break of four has a lead of 2min 15sec. Km 98: The break is being kept on a short leash. They are 2min 26sec ahead of the field. Km 130: The four escapees are 3min 16sec ahead of the pack. Lotto-Soudal is at the front of the peloton with Quick-Step close by. Oh, now the gap is 2min 40sec. Km 164: No real change as the riders cruise by the vineyards. The four escapees are 2min 22sec ahead of the pack. Km 184, 30 to go: The break is being rounded up. The gap is down to 42sec. The peloton can see the escapees. 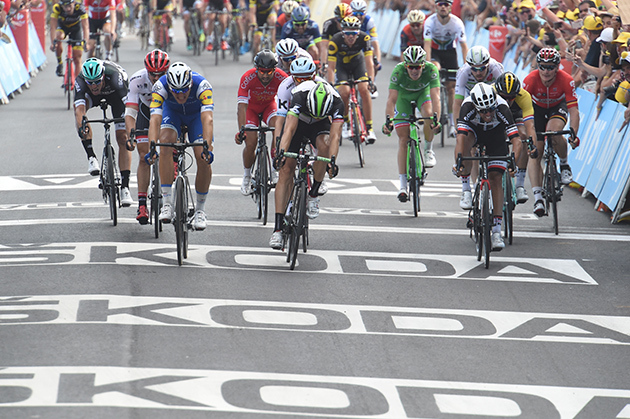 The finish: The breakaway was caught with just 5 kilometers to go, setting things up for a big bunch sprint. And, the man of the hour, Marcel Kittel, won the stage in a photo-finish fron Edvald Boasson Hagen. That makes three stage wins this Tour for Kittel. Chris Froome remains the GC leader. Marcel Kittel was over the moon as he claimed his third stage victory in the 104th Tour de France in Nuits-Saint-Georges, the wine growing town after which the St George crater has been named on the moon. 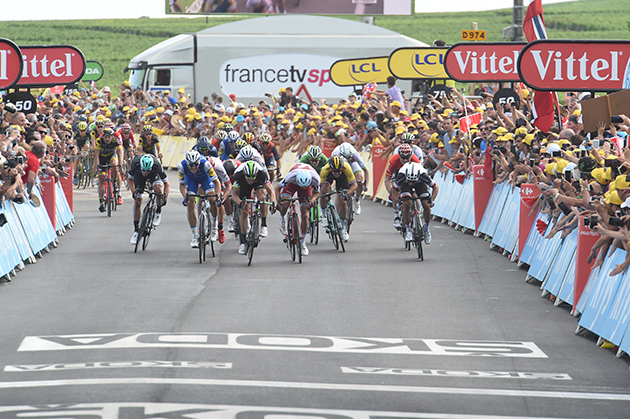 It was a very tight bunch sprint finish in Burgundy as photo-finish was necessary to determine that the German has beaten Edvald Boasson Hagen. Chris Froome retained the yellow jersey. 193 riders started stage 7 in Troyes. Maxime Bouet (Fortuneo-Oscaro) attacked from the gun to give birth to a four-man breakaway with Manuele Mori (UAE Team Emirates), Yohann Gène (Direct Energie) and Dylan van Baarle (Cannondale-Drapac). It didn't take a long time for the peloton to get organized with three domestiques setting the pace: Olivier Le Gac (FDJ), Lars Bak (Lotto-Soudal) and Julien Vermote (Quick-Step Floors), at the service of sprinters Arnaud Démare, André Greipel and Marcel Kittel respectively. 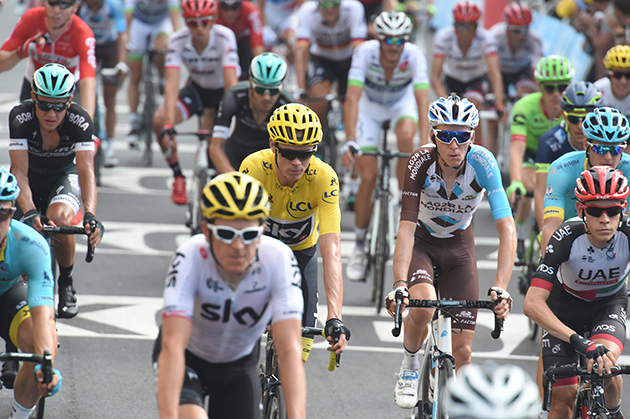 They were followed by the whole Team Sky wearing the yellow helmets of the leaders of the teams' classification and protecting race leader Chris Froome. As the maximum time gap was 3.40 at km 30, the escapees quickly understood their chances of success were minimal. The race situation remained stable until the race reached the vineyards of Burgundy with 50km to go. The undulating and curvy terrain, as well as some wind with many changes of direction, inclined the peloton to speed up. Their deficit went below one minute within 40km to go. But they waited for the right moment to catch the four breakaway riders and no attempt to split up the bunch was reported. The leading quartet surrendered with 6km to go. The FDJ team of green jersey holder Arnaud Démare was very visible in the run in but Dimension Data caught the right moment for South African champion Reinardt Janse van Rensburg to lead Edvald Boasson Hagen out. 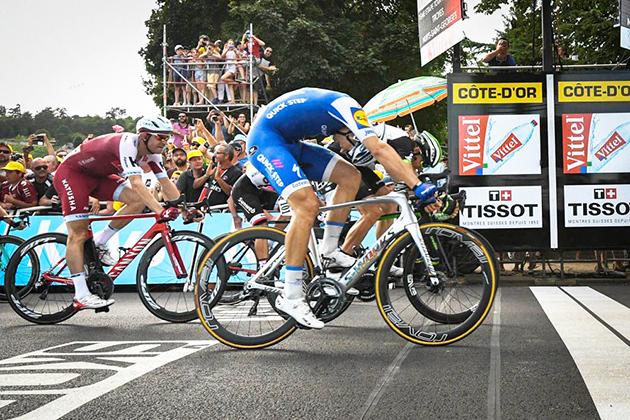 The Norwegian was close to claim his third Tour de France stage victory after he did so in Lisieux and Pinerolo in 2011 but the photo-finish eventually designated Marcel Kittel who himself didn't know if he had won or not. 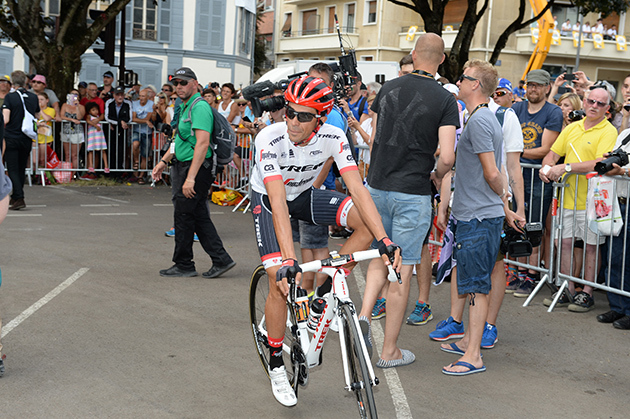 But it was his third success in this Tour de France and his twelfth one since he first started in 2012. He equals Erik Zabel to become the most successful German stage winner ever at the Grande Boucle. After the race Kittel said, "When I crossed the line, I really had no clue if I won or not. Before the finish, I knew it was going to be close. At 150m to go, I thought it was still 200, but luckily, the door opened on the right side I could pass Edvald [Boasson Hagen]. To reach twelve stage wins at the Tour is an incredible success. I'm in a great shape. I'm super happy. The lead out was great. It's just crazy. I already have three wins in this Tour. I'm so happy about that." 2 BOASSON HAGEN EDVALD DIMENSION DATA s.t. 3 MATTHEWS MICHAEL TEAM SUNWEB s.t. 4 KRISTOFF ALEXANDER KATUSHA-ALPECIN s.t. 5 DEGENKOLB JOHN TREK-SEGAFREDO s.t. 6 GROENEWEGEN DYLAN LOTTO NL-JUMBO s.t. 7 SELIG RÜDIGER BORA-HANSGROHE s.t. 9 GREIPEL ANDRÉ LOTTO SOUDAL s.t. 10 MC LAY DANIEL FORTUNEO-OSCARO s.t. 11 DEMARE ARNAUD FDJ s.t. 12 ZABEL RICK KATUSHA-ALPECIN s.t. 13 CALMEJANE LILIAN DIRECT ENERGIE s.t. 14 NAESEN OLIVER AG2R LA MONDIALE s.t. 15 PASQUALON ANDREA WANTY-GROUPE GOBERT s.t. 16 BAUER JACK QUICK-STEP FLOORS s.t. 17 JANSE VAN RENSBURG REINARDT DIMENSION DATA s.t. 18 COLBRELLI SONNY BAHRAIN-MERIDA s.t. 19 BOLE GREGA BAHRAIN-MERIDA s.t. 20 VANSPEYBROUCK PIETER WANTY-GROUPE GOBERT s.t. 21 PETIT ADRIEN DIRECT ENERGIE s.t. 22 CHAVANEL SYLVAIN DIRECT ENERGIE s.t. 23 ROELANDTS JURGEN LOTTO SOUDAL s.t. 24 HAYMAN MATHEW ORICA-SCOTT s.t. 25 BENOOT TIESJ LOTTO SOUDAL s.t. 26 IMPEY DARYL ORICA-SCOTT s.t. 27 VAN AVERMAET GREG BMC s.t. 28 YATES SIMON ORICA-SCOTT s.t. 29 BEVIN PATRICK CANNONDALE-DRAPAC s.t. 30 MC CARTHY JAY BORA-HANSGROHE s.t. 31 VAN KEIRSBULCK GUILLAUME WANTY-GROUPE GOBERT s.t. 32 KREUZIGER ROMAN ORICA-SCOTT s.t. 33 TULIK ANGÉLO DIRECT ENERGIE s.t. 34 CHAVES JOHAN ESTEBAN ORICA-SCOTT s.t. 35 PORTE RICHIE BMC s.t. 36 SÜTTERLIN JASHA MOVISTAR s.t. 37 SENECHAL FLORIAN COFIDIS s.t. 38 ROCHE NICOLAS BMC s.t. 39 ROWE LUKE SKY s.t. 40 GALLOPIN TONY LOTTO SOUDAL s.t. 41 HARDY ROMAIN FORTUNEO-OSCARO s.t. 42 ARASHIRO YUKIYA BAHRAIN-MERIDA s.t. 43 MINNAARD MARCO WANTY-GROUPE GOBERT s.t. 44 QUINTANA NAIRO MOVISTAR s.t. 45 THOMAS GERAINT SKY s.t. 46 LATOUR PIERRE-ROGER AG2R LA MONDIALE s.t. 47 KEUKELEIRE JENS ORICA-SCOTT s.t. 48 FROOME CHRISTOPHER SKY s.t. 49 GAUTIER CYRIL AG2R LA MONDIALE s.t. 50 LUTSENKO ALEXEY ASTANA s.t. 52 MEINTJES LOUIS UAE TEAM EMIRATES s.t. 53 ARU FABIO ASTANA s.t. 54 BARDET ROMAIN AG2R LA MONDIALE s.t. 55 FUGLSANG JAKOB ASTANA s.t. 56 POLJANSKI PAWEL BORA-HANSGROHE s.t. 58 MARTIN GUILLAUME WANTY-GROUPE GOBERT s.t. 59 BUCHMANN EMANUEL BORA-HANSGROHE s.t. 60 TALANSKY ANDREW CANNONDALE-DRAPAC s.t. 61 SIEBERG MARCEL LOTTO SOUDAL s.t. 62 HENAO SERGIO LUIS SKY s.t. 63 FEILLU BRICE FORTUNEO-OSCARO s.t. 64 DE KORT KOEN TREK-SEGAFREDO s.t. 65 BODNAR MACIEJ BORA-HANSGROHE s.t. 66 CONTADOR ALBERTO TREK-SEGAFREDO s.t. 67 BURGHARDT MARCUS BORA-HANSGROHE s.t. 68 HANSEN ADAM LOTTO SOUDAL s.t. 69 MAJKA RAFAL BORA-HANSGROHE s.t. 70 IRIZAR MARKEL TREK-SEGAFREDO s.t. 71 VUILLERMOZ ALEXIS AG2R LA MONDIALE s.t. 72 LANDA MIKEL SKY s.t. 73 PICHON LAURENT FORTUNEO-OSCARO s.t. 74 VICHOT ARTHUR FDJ s.t. 75 KÜNG STEFAN BMC s.t. 76 MARCATO MARCO UAE TEAM EMIRATES s.t. 77 SWIFT BEN UAE TEAM EMIRATES s.t. 78 BETTIOL ALBERTO CANNONDALE-DRAPAC s.t. 79 GUARNIERI JACOPO FDJ s.t. 80 ULISSI DIEGO UAE TEAM EMIRATES s.t. 81 URAN RIGOBERTO CANNONDALE-DRAPAC s.t. 82 BENNATI DANIELE MOVISTAR s.t. 83 BENNETT GEORGE LOTTO NL-JUMBO s.t. 84 GOGL MICHAEL TREK-SEGAFREDO s.t. 85 BRAJKOVIC JANEZ BAHRAIN-MERIDA s.t. 86 MOLARD RUDY FDJ s.t. 87 MOINARD AMAËL BMC s.t. 88 DEGAND THOMAS WANTY-GROUPE GOBERT s.t. 90 CARUSO DAMIANO BMC s.t. 92 OFFREDO YOANN WANTY-GROUPE GOBERT s.t. 93 BETANCUR CARLOS ALBERTO MOVISTAR s.t. 94 PAUWELS SERGE DIMENSION DATA s.t. 95 NIEVE MIKEL SKY s.t. 96 BARGUIL WARREN TEAM SUNWEB s.t. 97 SEPULVEDA EDUARDO FORTUNEO-OSCARO s.t. 99 MACHADO TIAGO KATUSHA-ALPECIN s.t. 100 FRANK MATHIAS AG2R LA MONDIALE s.t. 101 POLITT NILS KATUSHA-ALPECIN s.t. 102 MOLLEMA BAUKE TREK-SEGAFREDO s.t. 103 TEN DAM LAURENS TEAM SUNWEB s.t. 104 BAKELANTS JAN AG2R LA MONDIALE s.t. 105 BONO MATTEO UAE TEAM EMIRATES s.t. 106 KISERLOVSKI ROBERT KATUSHA-ALPECIN s.t. 107 SMITH DION WANTY-GROUPE GOBERT s.t. 108 WELLENS TIM LOTTO SOUDAL s.t. 109 ZUBELDIA HAIMAR TREK-SEGAFREDO s.t. 110 GASTAUER BEN AG2R LA MONDIALE s.t. 111 AMADOR ANDREY MOVISTAR s.t. 112 KWIATKOWSKI MICHAL SKY s.t. 113 LAMMERTINK MAURITS KATUSHA-ALPECIN s.t. 114 BROWN NATHAN CANNONDALE-DRAPAC s.t. 115 ZEITS ANDREY ASTANA s.t. 116 SABATINI FABIO QUICK-STEP FLOORS s.t. 117 DURASEK KRISTIJAN UAE TEAM EMIRATES s.t. 118 SCHÄR MICHAEL BMC s.t. 119 SINKELDAM RAMON TEAM SUNWEB s.t. 120 VALGREN ANDERSEN MICHAEL ASTANA s.t. 121 EDET NICOLAS COFIDIS s.t. 122 DOMONT AXEL AG2R LA MONDIALE s.t. 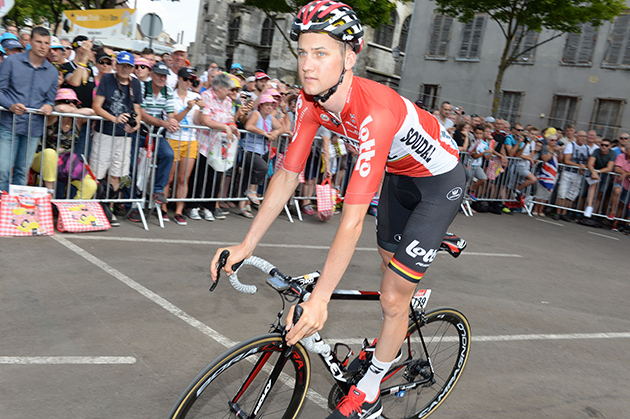 123 BAK LARS YTTING LOTTO SOUDAL s.t. 124 SIMON JULIEN COFIDIS s.t. 127 QUEMENEUR PERRIG DIRECT ENERGIE s.t. 128 THWAITES SCOTT DIMENSION DATA s.t. 129 TRENTIN MATTEO QUICK-STEP FLOORS s.t. 130 GILBERT PHILIPPE QUICK-STEP FLOORS s.t. 131 LAENGEN VEGARD STAKE UAE TEAM EMIRATES s.t. 132 STYBAR ZDENEK QUICK-STEP FLOORS s.t. 135 VACHON FLORIAN FORTUNEO-OSCARO s.t. 136 LEMOINE CYRIL COFIDIS s.t. 137 EISEL BERNHARD DIMENSION DATA s.t. 140 GRIVKO ANDRIY ASTANA s.t. 141 MARTENS PAUL LOTTO NL-JUMBO s.t. 142 MORENO BAZAN JAVIER BAHRAIN-MERIDA s.t. 143 GESBERT ELIE FORTUNEO-OSCARO s.t. 144 FELLINE FABIO TREK-SEGAFREDO s.t. 147 DELAGE MICKAËL FDJ s.t. 148 TEUNISSEN MIKE TEAM SUNWEB s.t. 149 GRUZDEV DMITRIY ASTANA s.t. 155 HOLLENSTEIN RETO KATUSHA-ALPECIN s.t. 159 CIMOLAI DAVIDE FDJ s.t. 161 MORI MANUELE UAE TEAM EMIRATES s.t. 162 BOUET MAXIME FORTUNEO-OSCARO s.t. 163 GESCHKE SIMON TEAM SUNWEB s.t. 164 ATAPUMA JOHN DARWIN UAE TEAM EMIRATES s.t. 168 WAGNER ROBERT LOTTO NL-JUMBO s.t. 169 DE GENDT THOMAS LOTTO SOUDAL s.t. 170 KNEES CHRISTIAN SKY s.t. 171 HOWSON DAMIEN ORICA-SCOTT s.t. 172 SICARD ROMAIN DIRECT ENERGIE s.t. 173 GESINK ROBERT LOTTO NL-JUMBO s.t. 174 NAVARRO DANIEL COFIDIS s.t. 175 PHINNEY TAYLOR CANNONDALE-DRAPAC s.t. 176 PANTANO JARLINSON TREK-SEGAFREDO s.t. 177 GRMAY TSGABU GEBREMARYAM BAHRAIN-MERIDA s.t. 178 CATALDO DARIO ASTANA s.t. 179 KIRYIENKA VASILI SKY s.t. 180 CINK ONDREJ BAHRAIN-MERIDA s.t. 181 ROGLIC PRIMOZ LOTTO NL-JUMBO s.t. 182 KOZHATAYEV BAKHTIYAR ASTANA s.t. 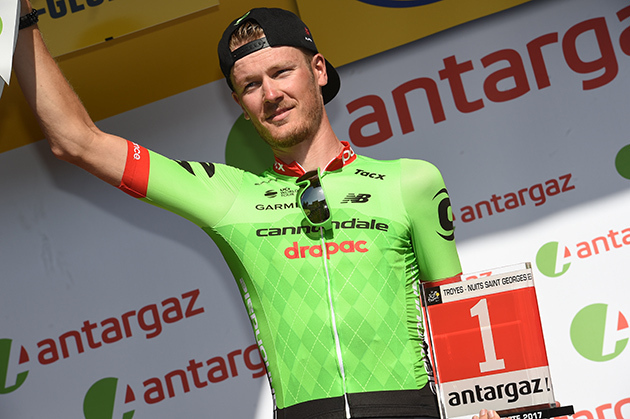 183 VAN BAARLE DYLAN CANNONDALE-DRAPAC s.t. 184 HERRADA JESÚS MOVISTAR s.t. 185 ROLLAND PIERRE CANNONDALE-DRAPAC s.t. 186 SAGAN JURAJ BORA-HANSGROHE s.t. 188 GENE YOHANN DIRECT ENERGIE s.t. 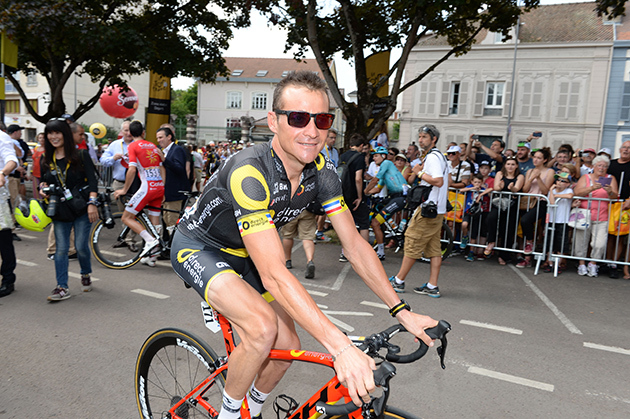 189 VOECKLER THOMAS DIRECT ENERGIE s.t. 193 VERMOTE JULIEN QUICK-STEP FLOORS s.t. 11 URAN RIGOBERTO CANNONDALE-DRAPAC s.t. 50 ULISSI DIEGO UAE TEAM EMIRATES s.t. 81 BEVIN PATRICK CANNONDALE-DRAPAC s.t. 103 ZABEL RICK KATUSHA-ALPECIN s.t. 117 FELLINE FABIO TREK-SEGAFREDO s.t. 174 VAN KEIRSBULCK GUILLAUME WANTY-GROUPE GOBERT s.t. Tim Wellens heads to the start line. And Marcel Kittel (blue kit on the left) wins in a photo finish. The side view shows how close it was. 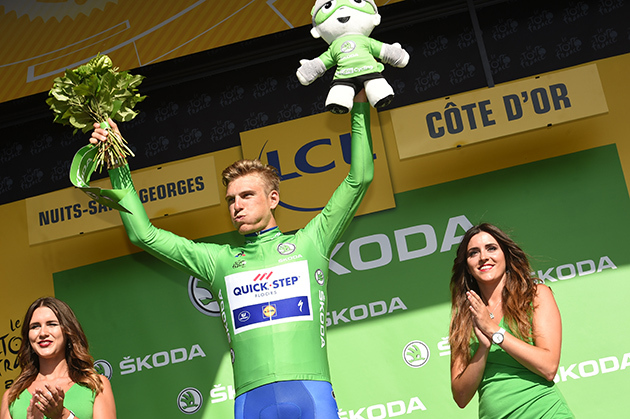 Stage winner Marcel Kittel is the new green jersey. Dylan van Baarle was awarded the red number for being the day's most aggressive rider. 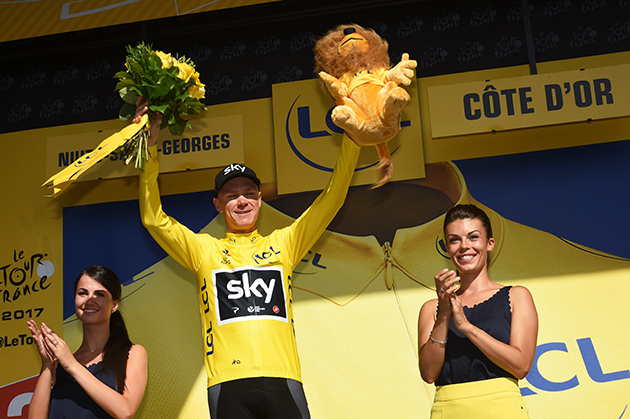 Chris Froome gets another little stuffed lion. On the moon, St George is a crater, named with Anglicized spelling by the crew of the mission Apollo XV in 1971 after the bottle of wine that appears in Jules Verne's novel “From the earth to the moon” written in 1865. It was a Nuits-Saint-Georges, from Burgundy. 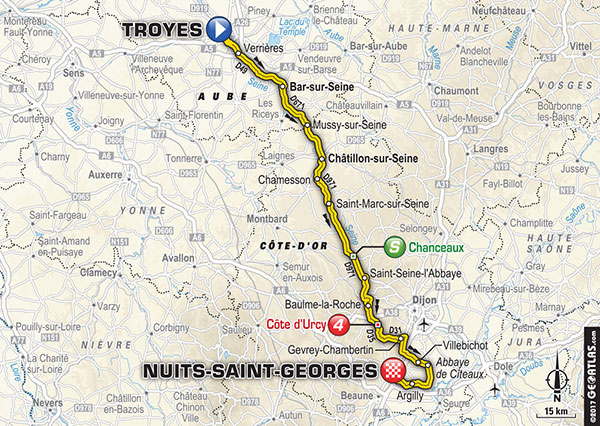 Starting in Troyes where Marcel Kittel made himself the most successful sprinter of the 104th Tour de France so far with two victories, stage 7 will finish in Nuits-Saint-Georges that never hosted a stage of the Grande Boucle before. 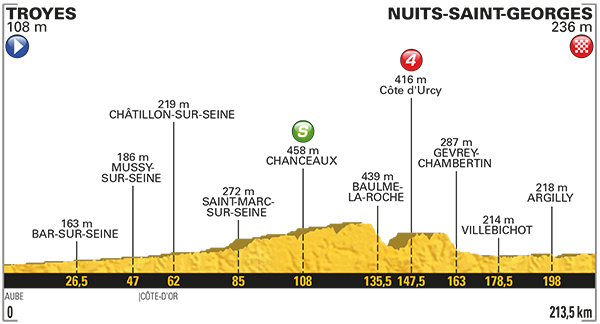 Two stage finishes of Paris-Nice indicate the place suits the sprinters. They were won by Freddy Maertens in 1977 and Matt Goss the week before the Australian triumphed in Milan-Sanremo in 2011. But as much as stage 6 looked on paper like an inevitable bunch gallop at the end, the race on stage 7 might not be as easy to read as the previous one. The 50-km long conclusive loop in the vineyards, from Gevrey-Chambertin – a magic name in wine culture – to Nuits-Saint-Georges favors breakaways. 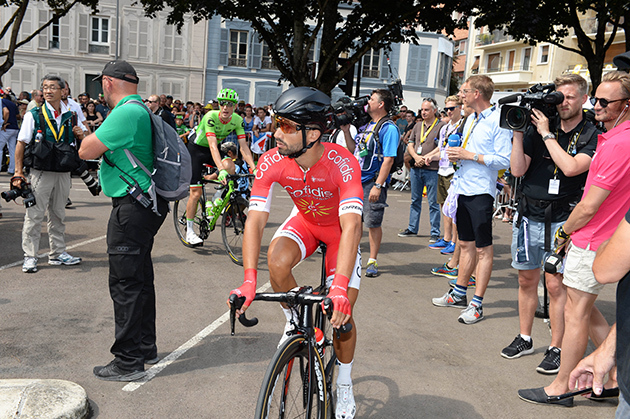 Shall it be a sprint finish anyway, the 2-km long final straight will offer a great spectacle with the likes of André Greipel and Alexander Kristoff eager to challenge Kittel and green jersey holder Arnaud Démare who have built their confidence on winning early in this Tour. Nuits-Saint-Georges is a nice place for celebrations.